COMMENT: Common sense at last. Palmair goes off into the "hangar in the sky"
Korean Air has announced that its A380 launch schedule between Seoul and Tokyo and Hong Kong will start on 1 June. The tickets are now on sale. AERBT reported in its issue of 10 January that the airline will become the first carrier to offer the upper deck solely dedicated to a Business Class offering. The daily utilisation of the aircraft includes a 10:30 departure from Seoul/Incheon, to Tokyo/Narita and then an evening/overnight service to and from Hong Kong. The airline will gradually expand its A380 service to Bangkok in July, once the second A380 arrives. The third A380 will launch to New York from August, and fourth A380 to Los Angeles in October. The airline’s A380 will have a total of only 407 seats making it the least crowded of all A380s. On the lower level there is 12 First Class seats 301 Economy Class seats with 94 Prestige Class on the upper deck. 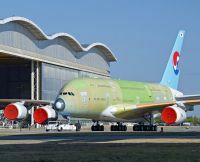 Korean Air has ordered 10 A380 aircraft with the first five to be delivered by the end of 2011 and an additional five by 2014. 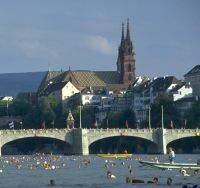 British Midland International (bmi) is to serve Basel from both Heathrow and Manchester from the start of the summer season 27 March 2011. The routes will be operated in partnership with Swiss, and offer three flights per day on weekdays between Heathrow and Basel, with two services on Saturdays and Sundays, and a daily weekday flight between Manchester and Basel. Both airlines are owned by Lufthansa. Services will be flown by bmi using an Airbus A319 aircraft offering a Business Class and Economy cabin. The airline faces stiff competition, the route already served from London by BA (Heathrow), Swiss (London City) and easyJet (Gatwick). Travellers to and from Ireland have now at last a proper fast connecting facility at London City Airport a service expected to attract passengers from alternative gateways. 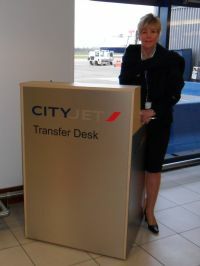 Following an initiative by CityJet, passengers on a through ticket from any of the 15 possible European connections on the airline at London City can check-in at the departure airport, and also their luggage, in the knowledge that they will be met by a representative of the carrier at a new designated stand just before immigration at City Airport. They will then be personally escorted through a new ‘fast track’ arrangement and straight into the departures lounge and if necessary, the gate. Travelodge, which claims to be the UK’s fastest growing hotel company, is to build 35 new hotels (3,667 rooms) this year boosting the company’s estate to 495 hotels and 35,841 hotels. It has also announced an increase in its growth targets and plans to operate 1,100 hotels totalling 100,000 rooms by 2025. Over half of the Travelodge hotels being built this year are situated in major UK cities. There are eight hotels being built in London, with three opening this year – this will mean Travelodge will become the largest single hotel brand in the capital this spring. Three hotels are under development in Birmingham, one at the NEC and two city centre locations (Carrs Lane and Bullring). In Manchester Travelodge is opening at the MEN arena and at the University. There are also city centre hotel openings in: Bristol, Cambridge, Canterbury, Cardiff, Hull, Lancaster and Liverpool. Singapore’s Shangri-La's Rasa Sentosa Resort, has re-opened after completing a 10-month, extensive refurbishment. The resort, which is the only beachfront hotel in Singapore, now offers additional room options that are designed specifically to suit the different needs of the traveller. Rather than picking from a traditional room category list, guests with children can choose to check into a larger family room instead of having connecting facilities rooms, and honeymooners can ask to stay in the Panorama Room, which offers romantic views of the South China Sea. Shangri-La’s Rasa Sentosa Resort features seven dining options. Corporate guests can look forward to holding meetings in newly refurbished function rooms, each featuring intelligent lighting systems, soundproof double walls and the latest audio-visual equipment. With an eye for family business Cool Zone is the largest children’s club provided by a hotel in Singapore. 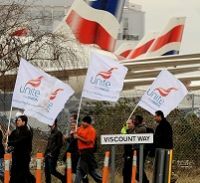 British Airways faces yet further industrial action later this year after some cabin staff who are members of the Unite Union voted in favour of strikes. The actual numbers make for interesting reading with union members now said to be only 10,200 out of a total complement of 13,500. 5,751 were in favour of walking out, that is 43% of the cabin crew. In what is seen as a deliberate attempt to unsettle senior management Unite chose last Friday (21 January) to announce the figures, a “rest day” for both British Airways and Iberia shares, with IAG Plc, the combined operation, due to start trading on the London and Madrid stock markets today. The company is hosted in London with Willie Walsh and his retinue based in the Compass building on the Bath Road actually overlooking the northern runway. A guy was on the side of the road hitchhiking on a very dark night and in the middle of a storm. The storm was so strong he could hardly see a few feet ahead of him. Suddenly he saw a car coming towards him and stop. Without thinking about it he got into the back seat, closed the door and then realized there was nobody behind the wheel! The car started slowly but as he looked ahead he saw a curve coming his way. Scared, he started to pray begging for his life. Suddenly just before the curve, a hand appeared through the window and moved the wheel. Paralysed in terror he jumped out of the car and ran! Wet and in shock, he came to a pub and started telling everybody about his horrible experience. A silence enveloped when they realized the guy was serious. About half an hour later, two fellows walked in the same pub. They looked around for a table when one said to the other, "Look John, that’s the guy who got in the car when we were pushing it." Last week London City Airport was given the final go-ahead to expand from a current maximum of 90,000 movements a year to 120,00 following a High Court hearing. At virtually the same time London Mayor Boris Johnson called for a new airport to be built in south-east England after a report said Heathrow was losing out to European rivals, reigniting the debate on London's airport capacity. The London City news is good for the capital and all the businesses that now rely on the airport. It is a victory for common sense and Newham Borough Council who were initially opposed to the whole concept but now give the airport vital help. The expense and aggravation of the hearing was caused by yet another minority group who gained funds (and media coverage) for a protest that had no foundation in law. Currently 10 airlines serve 35 destinations at the former docklands airport. A one-third increase in movements gives scope for real expansion. No investment in terms of extra taxiways is required. The airport’s record year was 2008 with 3.3m passengers and 83,922 actual movements. For the future a doubling of passengers is quite possible. In time the 50-seat turboprops that were initially the foundation of the airport will be replaced by 70-seat prop jets and also 100-seat jets. The management has a wish-list of new airports to add as destinations. "The capital's airports are full, our runways are crammed and we risk losing jobs to Frankfurt, Amsterdam, Madrid or other European cities should we fail to act," Mr Johnson said last week after the report was published. "We need to start planning for a brand new airport that can help meet the ever-increasing demand for aviation and act as a hub, particularly to the rest of the UK." An imaginative scheme, that for a third short runway at Heathrow was hastily scrapped for pure political reasons after an exhaustive public enquiry that gave the go-ahead when the Conservative-Liberal Democrat coalition government took office in May. What a waste of money and effort. The Mayor’s aviation advisor Daniel Moylan, a banker, says that a new airport should be built in the Thames Estuary and that Heathrow allowed to become a secondary point to point airport. Tell that to Mr Johnson’s past constituents in Henley, his former seat when he was Member of Parliament. The area is dependent on Heathrow. Mr Johnson’s current focus is the London Mayoral election of 2012, once again up against Ken Livingstone. Mr Livingstone, to his credit, was party to the bid that secured the Olympics to London, only for the ultimate prize, of carrying the Olympic flag out of Beijing, undertaken by Boris. Ken would love to win in May 2012 and play host to the world. Logic will go out of the window as they both make their play to the electorate over the next 15 months for the glory of being the London chief in July 2012. Sadly the airport issue will be moribund. The London City Airport expansion is good news for the air transport industry and the country. Whilst the Thames Estuary scheme is fine in theory, in practice it is a non-starter for all sorts of reasons. 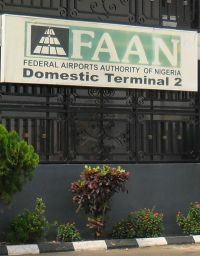 In March the Government will issue a “scoping document” as part of an air transport review in 2012. More waffle. Fortunately London is still the clear leader in attracting business travel and tourists but is gradually losing out, now serving 157 airports compared to Frankfurt’s 235 and Paris Charles de Gaulle’s 224. London City is good news. Heathrow, Gatwick, Luton and Stansted it’s no news that aggravates. The air transport industry wants to know where it is going now. Virgin Blue has a new shareholder, Air New Zealand. ANZ has notified the Australian and New Zealand Stock Exchanges that it has become a substantial shareholder in the carrier, as part of a planned acquisition of a shareholding between 10% and 14.99%. “The investment in Virgin Blue is part of Air New Zealand’s strategy to develop scale and reach in this region. 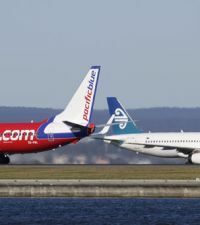 The Tasman alliance with Virgin Blue was the first step in this strategy. This investment cements the emerging relationship between our two airlines and demonstrates the confidence we have in Virgin Blue both as an entity and as a partner for Air New Zealand,” said Air New Zealand Chief Executive Officer Rob Fyfe. He confirmed that there is no intention to make a takeover bid for Virgin Blue in which the UK Virgin Group has a 26% shareholding. Peyton Place used to be the “never ending story” for those old enough to remember the series on TV. Sadly the Boeing 767 Dreamliner has entered the same phase, although Boeing now says it expects first delivery to ANA in the third quarter of this year. The new delivery date reflects the impact of an in-flight incident during testing last November and includes the time required to produce, install and test updated software and new electrical power distribution panels in the flight test and production aeroplanes. Emirates is to add Copenhagen to its network from 1st August with a daily Airbus A300-200 operation in a three class layout. It will be the airlines 27 destination in Europe. It is the third new route announced by the airline for 2011, following Basra on 2 February and Geneva on 1 June. Aer Lingus is to introduce at the end of March a new daily service between Shannon and Gatwick, a route that other carriers have operated previously. 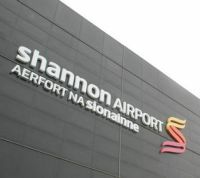 Aer Lingus Director of Communications, Declan Kearney, said: “This new daily service will provide Aer Lingus customers with the first early morning flight from London to the Shannon region. It will complement the existing London Heathrow service, which operates three times daily, broadening the choice for business and leisure travellers in and out of the Mid-West region.” From London the Gatwick flight is the earliest by Aer Lingus to Shannon. Bournemouth Airport will be without one of its regular sights this coming summer, a Palmair branded aircraft. Owner Bath Travel is scrapping its tour operator Palmair arm after being what it calls “swamped by Ryanair”. The very long established travel company returned its last Palmair aircraft to a leasing company last autumn, but had planned to continue by sub-chartering seats on Thomson Airways flights. 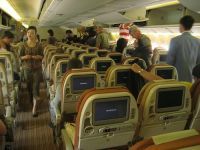 Barcelona is the latest destination for Singapore Airlines who will introduce a three times per week service on 28 March. The flight then goes on to Sao Paulo in Brazil also offering that city for the first time. Scheduled times are 13hrs 30mins to Barcelona, the second leg 11hrs 30mins with a three-class Boeing 777-300ER the operating aircraft. India is the target of Wyndham Hotels following a year of rapid growth in Asia with six Wyndham branded hotel openings in China and another seven under construction. Wyndham claims to be the world’s largest hotel company with nearly 7,200 hotels and nearly 606,000 rooms in 65 countries under 12 brands. Boeing has started final assembly of the 1,000th 767 aircraft, a 767-300ER (extended range) passenger model for All Nippon Airways (ANA). 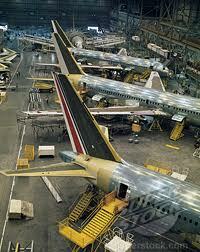 The 767 entered airline service in 1982 and in 1985 initiated twin-engined transoceanic operations. It is often compared to the Airbus A330 which followed over 10 years later, with 744 delivered to date. 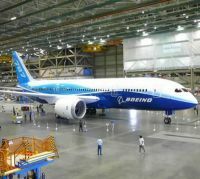 Both aircraft have had a much extended production life due to delays with the Boeing 787 and Airbus A350 series respectively. Much depends on a US Air Force tanker order as to which plane will be the eventual best seller. The 1,000th aircraft is scheduled for delivery next month. ANA, a long-time Boeing customer, has taken delivery of 89 767s since placing its first order in 1979. A320 output led the way last year as Airbus powered a record number of 510 (2009: 498) commercial aircraft deliveries to 94 customers (of which 19 were new). These included 401 A320 family, 91 A330/A340s and 18 A380s. The essentially Toulouse-based division of EADS booked 644 commercial aircraft orders including 452 A320 series aircraft, 160 A330/A340/A350 XWB which it now calls Family aircraft, and 32 new orders for the A380. At 2010 year end, Airbus’ commercial order book backlog was 3,552 aircraft equalling six years of full production. London City Airport irregular visitors will probably be perplexed upon entering the terminal building realising that something has changed but not actually putting a finger on it. In fact the atrium has been filled in and the expanded first floor area produced will be mainly used for what the airport describes as “a full-flow and much improved security area”. The work is expected to be completed next month. 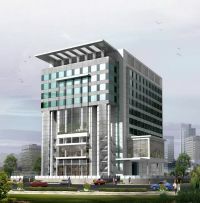 Langham Hotel Group has embarked on an expansion campaign in India with new properties in the city of Lavasa, Western India for 2013, later this year a Langham Place in Pune, and opening in the first quarter 2011 the 93-room Eaton Smart, New Delhi Airport Transit Hotel. The Eaton Smart, New Delhi Airport Transit Hotel is located inside Terminal 3 of the new airport building. Passengers with valid tickets are able to check into the 36-room domestic wing or into the 57-room wing in the international terminal after customs controls. The property offers modern rooms for a minimum slot of five hours allowing guests to relax before and after a flight. Guests are able to reserve the Aqua Pods in which to freshen up while allowing access to the hotel’s services and facilities. Middle East Airlines (MEA), the national carrier of Lebanon, will sign an agreement on 28 February to officially start the process of joining SkyTeam in 2012. First established in 1946 and using de Havilland Dragon Rapides, the airline has seen more ups and downs than most, headquartered in that most beleaguered of cities, Beirut. MEA has continued to improve its products and services to customers ever since it successfully concluded a thorough restructuring plan, destined to modernize and restructure the airline. Key elements of this plan include aircraft renewal and rationalization, increasing the density of its European, Middle East and West African network and improving product quality and consistency. It currently operates an all Airbus fleet of 11 A320 series aircraft and four A330-200s. Barcelona’s relationship with Ryanair could be short lived after the Dublin-based carrier lost a case in the local commercial courts which ruled that the airline’s €40/£40 boarding card reissue fee is unlawful. 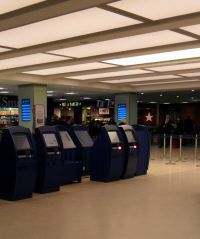 The carrier is appealing on the grounds that all passengers agree at the time of booking that they will check-in on-line, and print off their own boarding cards at least four hours prior to the scheduled departure of their flight. 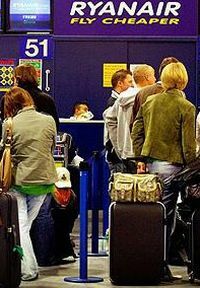 The airline says that should this ruling not be reversed on appeal, then it will dispense with the boarding card reissue fee altogether, and passengers who arrive at the airport without the agreed pre-printed boarding card will not be able to pass through security or board their aircraft. 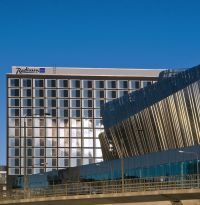 Rezidor Hotel Group has opened its new flagship hotel in Sweden, the Radisson Blu Waterfront Hotel, Stockholm, with direct connection to the Waterfront Congress Centre – one of Scandinavia’s largest facilities for meetings and events. The property has an ideal location, within walking distance of the Arlanda Express rail link to the airport and the central railway station. Within close proximity to Stockholm’s business district, shopping, Gamla Stan, the Royal Palace and the City Hall. The hotel’s 414 rooms offer views of the Riddarfjärden stretch of water and the City Hall. Three suites are situated on the top floor with panorama windows, the largest with 74m² of floor space, consisting of a bedroom with a king size bed, bathroom with a round bath tub, living room with a sofa suite, dining table and a television, and a separate guest toilet. All rooms and suites feature Radisson signature services such as free high speed internet access. The introduction last week of a daily (except Saturday) service by CityJet to Florence from London City Airport is expected to open up one of Europe’s most fascinating cities not for only those who now habitually use the docklands airport, but with the airline’s new flight connections service also for passengers from Dublin, Edinburgh and Scandinavia. The great advantage at the Italian end is that Florence Airport is just on the outskirts of what is not a very large city (350,00 population), a 20-minute taxi ride to the centre. The airport reflects the size of the metropolis and is small and user friendly. 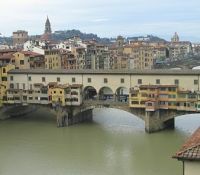 With one or two exceptions Florence is without any multi-national branded hotels, and most of the properties are relatively small in the Italian tradition. The inaugural party stayed at the two-year-old Four Seasons, an amazing 116-individual suite property 15 minutes stroll from the main downtown area and sited in an 11-acre park. Built around the vestiges of two adjoining Renaissance palaces it is worth a visit on its own. Florence has been an UNESCO World Heritage site since 1982. Tradition has it that it was established by Julius Caesar in 59 BC but it is probably far, far older. In 774 the city and Tuscany was conquered by Charlemagne. From about the start of the second millennium its golden age began to emerge. In 1301, Dante was sent into exile from here (commemorated by a plaque on one of the walls of the Uffizi). For a time it was one of the richest and wealthiest of European cities, a Republic with republican virtues. The Medici family emerged as patrons of the arts commissioning works by Michelangelo, Leonardo da Vinci and Botticelli. What you see today is the result of competition between various families and hierarchies in trying to build the biggest and best. For a short time (1865-1870) it was the capital of the Kingdom of Italy. 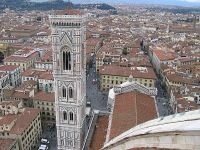 One of the problems at the present time is that Florence does not have a visitors card covering all the major museums which is something the excellent local tourist board is working on. Our recommendation is to take one of the two competing open top hop-on hop-off bus tours when first arriving in order to get a feel for the place. 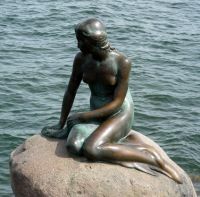 The local guides and foot tours are excellent with fine English and a deep knowledge of the city’s fascinating history. One can hire a bike and for those a little more adventurous, a Segway. The state run museums offer free admission for those over 65 but you do need to show a passport. If you are visiting in the summer try and book your museum visit in advance. The place gets very busy. The Palazzo Vecchio is the town hall of Florence. 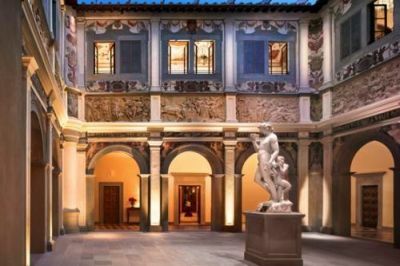 This massive, gothic fortress-palace is impressive overlooking the Piazza della Signoria with its 100-year-old copy of Michelangelo’s famous David statue as well as the gallery of statues in the adjacent Loggia dei Lanzi. It is one of the most significant public places in Italy. The actual David itself is housed in the Accademia dell'Arte del Disegno, founded in 1561 with patronage of the Medici by Giorgio Vasari, Agnolo Bronzino and Bartolommeo Ammannati, three of the central artists of Mannerism. Michelangelo was born in Florence and produced his early work in the city. At the age of 21, and with the end of the Medici era, he was financially persuaded to move to Rome. He died their after a long and productive life in 1564 aged 89 and whilst that city wished to offer itself as his final resting place his wishes were fulfilled and he is buried in the Basilica di Santa Croce (Basilica of the Holy Cross), the principal Franciscan church of Florence. It lies to the east of the central area close by the National Library, another magnificent building but dating only from 1935. Another name know to many in the 21st century from even before Michelangelo is Niccolò Machiavelli, whose prescriptions for Florence's regeneration under strong leadership have often been seen as a legitimization of political expediency and even malpractice. Commissioned by the Medici, Machiavelli also wrote the Florentine Histories, the history of the city. He lived from 1469 to 1527. The Uffizi Gallery is one of the oldest and most famous art museums in the world. In 1560, Giorgio Vasari built the palace for Cosimo I de' Medici as the offices for the Florentine magistrates. The massive cathedral church, called the Duomo, was begun in 1296 but its elaborate neo-Gothic façade was not added until towards the end of the 19th century. The adjoining bell tower offers an unique view of the city and the surroundings. There is usually a long queue and it has 414 steps. At the heart of the city, in Piazza della Signoria, is Bartolomeo Ammanati's Fountain of Neptune (1563–1565), which is a masterpiece of marble sculpture at the terminus of a still-functioning Roman aqueduct. 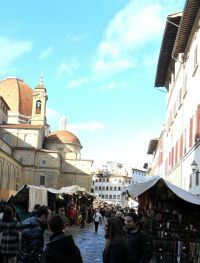 Florence is the city of Gucci and for shoppers it is heaven starting at the market of San Lorenzo. Eating is another popular Italian occupation and here the choice is vast. However you dine it needs a Chianti. In a short review it is impossible to mention everything regarding this iconic city, suffice to say that all the following either lived within its environs or were closely involved. Boccaccio, Botticelli, Brunelleschi, Roberto Cavalli, Dante, Donatello, Galileoi, Guccio Gucci, Machiavelli, Catherine de' Medici, Michelangelo and Emilio Pucci. And many others too. Building after building has its connections. Four nights is really needed and there is the rest of Tuscany to visit too.